We endeavour to provide high-quality care and professional service with treatment tailored to each patient. Our practice offers a warm welcome, with a friendly atmosphere. 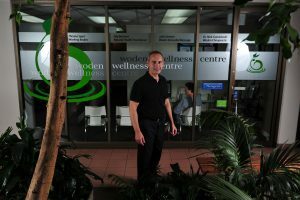 Our Chiropractor, Dr Nick Gondzioulis believes in empowering his patients with regard to their particular condition. When booking appointments we allow the time to impart helpful and up to date information on nutrition, exercise, ergonomics and lifestyle changes. Our staff also endeavour to inspire and educate our patients and the community to be pro-active in their own well-being and in referring others for chiropractic care. Chiropractors don’t just treat the site of pain but take a holistic approach to assess the causes of pain and restricted movement. As a result, this leads to long term solutions for a healthy body. Chiropractic is a drug and surgery free modality of treatment which is also concerned with the diagnosis, management and prevention of mechanical disorders of the musculoskeletal system [source]. The practice of chiropractic focuses on the relationship between structure (primarily the spine) and function (as coordinated by the nervous system) and thus, how that relationship affects the preservation and restoration of health. Dr Nick is focused on patients as individuals. After conducting a full history and an examination, he will discuss your treatment options with you. Nick uses a range of treatment techniques to suit your individual needs and also your care preferences. These may include manual adjustment or instrument assisted adjusting. He also uses soft tissue manipulation, trigger point therapy, and cold laser therapy to help you get the best results possible from each treatment.